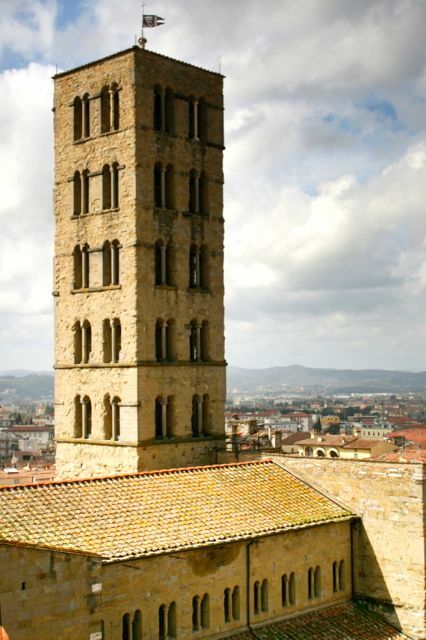 Today we went on a day trip to the Tuscan city of Arezzo. We had booked ahead to see the frescoes by Piero della Francesco in the church of San Francesco. Do not forget to do this if you want to see the frescoes as you have to book a time slot and spaces are limited. These beautiful frescoes show the Story Of The True Cross, a convoluted medieval tale about the crucifix on which Jesus died. Because Piero della Francesca was a mathematician as well as a painter, he has chose to give the paintings symmetry by juxtaposing similar scenes across the apse rather than sticking to a chronological order, for example, the two battle scenes are opposite each other. 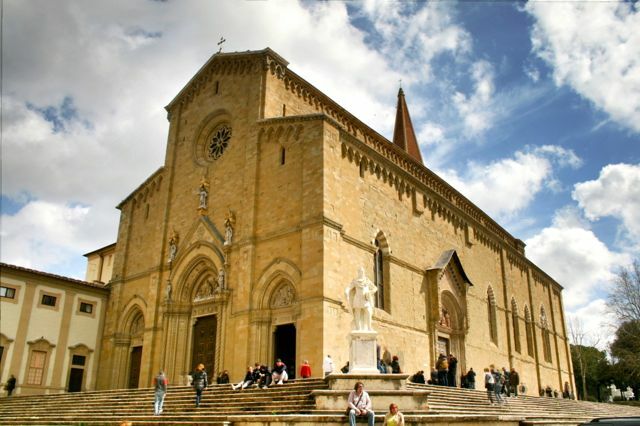 Once we had admired the paintings we wandered past the impressive church of Pieve di Santa Maria, built in the Tuscan Romanesque style more commonly found in the northern Tuscan towns of Pisa and Lucca. 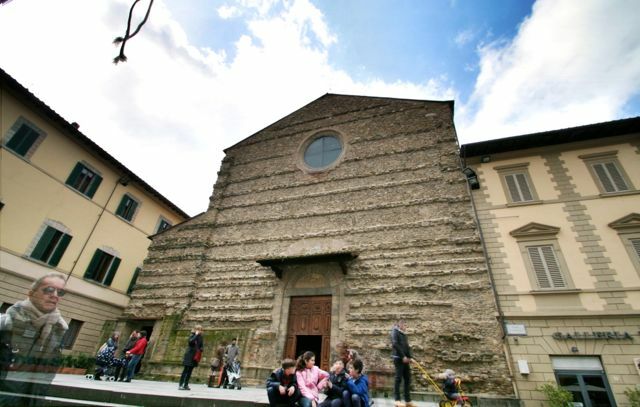 The church is also unusual because the facade faces the street rather than the Piazza Grande. 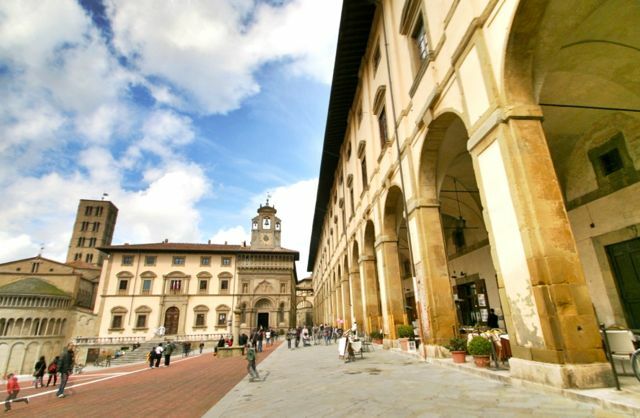 The Piazza Grande is one of the sights you should not miss when visiting Arezzo, as its name suggests, this is a large piazza surrounded by beautiful buildings including the Loggia di Vasari which runs along the eastern edge. Giorgio Vasari was born in Arezzo, he was famous as the first art historian, an architect (he designed the Ufizzi in Florence) and as a painter (although in this role he is not so highly regarded). 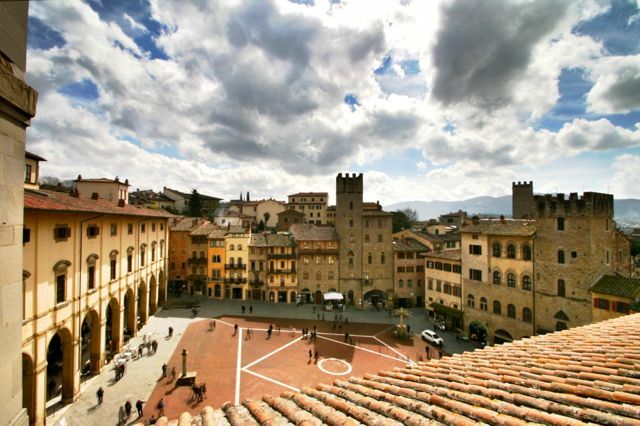 The piazza slopes upwards towards the south eastern corner and is the main area for Arezzo’s monthly antiques market (1st Sunday of every month). While standing in the Piazza Grande, I noticed that people were on top of the Palazetto della Fraternita dei Laici. I enquired at the entrance and found that you could enter the Palazetto for a reasonable €2 fee and, after a short climb, get up to the clock tower. Up here there were great views of the Piazza Grande and across the rest of town. From the Piazza Grande, we wandered on to the Duomo to see another small fresco by Piero della Francesca, Mary Magdelene. You can find this fresco on the wall at the far left of the nave from the entrance. 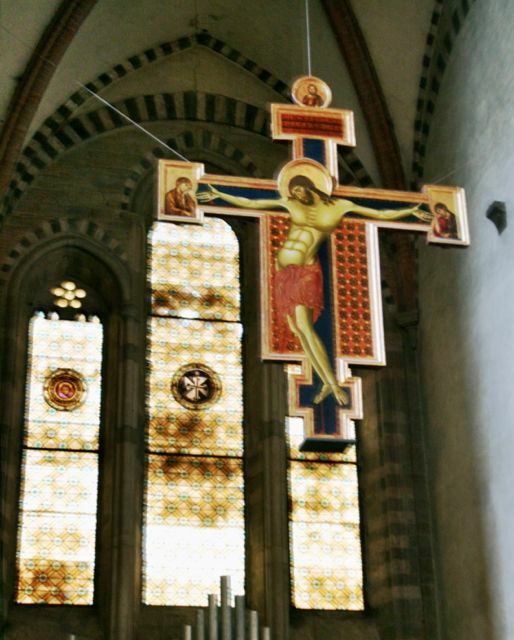 The next stop on our lightning tour of Arezzo was the church of San Domenico to see Cimabue’s crucifix which hangs above the altar. There are beautiful travertine windows in the apse that are cut very thinly so that they are translucent and show off the patterns in the stone. The nave of this large church is covered with badly damaged frescoes. We stopped at little enoteca / delicatessan for a superb light lunch of cheeses meats, olives and artichokes served with bread. 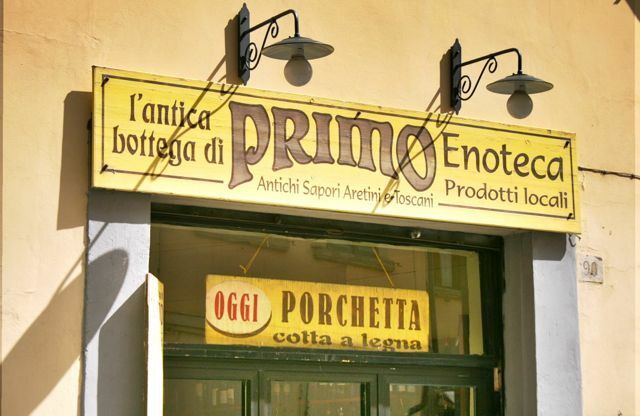 You can find this enoteca in Corso Cavour at the south east end of town.